APPEARANCE: Haradashi is a goofy-looking yōkai that can change into various different forms. Occasionally a haradashi will appear as a headless torso with arms, legs, and comical facial features on its belly. Other times it looks like a kind, elderly nun, or a goofy female monster with long black hair. Whatever form it takes, the defining characteristic of a haradashi is the large, silly-looking face which appears on the creature’s enormous stomach. 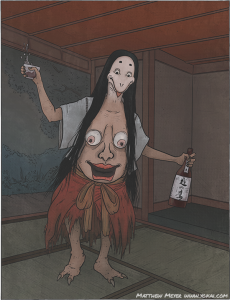 BEHAVIOR: Unlike most yōkai, haradashi do not do anything harmful. They are cheerful and agreeable yokai, and enjoy amusing others and cheering people up. They frequently disguise themselves as ordinary humans and then use their belly faces to surprise people and make them laugh. INTERACTIONS: Haradashi appear to sad and lonely individuals, particularly those who are at home drinking alone. Haradashi will slip into these peoples’ houses to cheer them up. When offered a drink, a haradashi happily accepts it, and then bares its belly and performs a ridiculous dance. Those who entertain a haradashi in their homes find that their troubles and worries vanish, and they become filled with hopes and dreams. Haradashi don’t only perform house calls. They make their homes in old temples and invite in those who need help. They call out to people who are lost or seeking shelter from the snow or rain, and invite them to stay the night in their temple. A haradashi will present its guest with a warm room and a hearty meal, and of course entertain with its signature belly dance.